Balancing motherhood, career and identity through various seasons in our life may be one of the biggest challenges we face as women. This week’s podcast guest, Kat Armstrong, guides us through a biblical framework for answering some of the key questions surrounding our calling in Christ and our assignments in life. 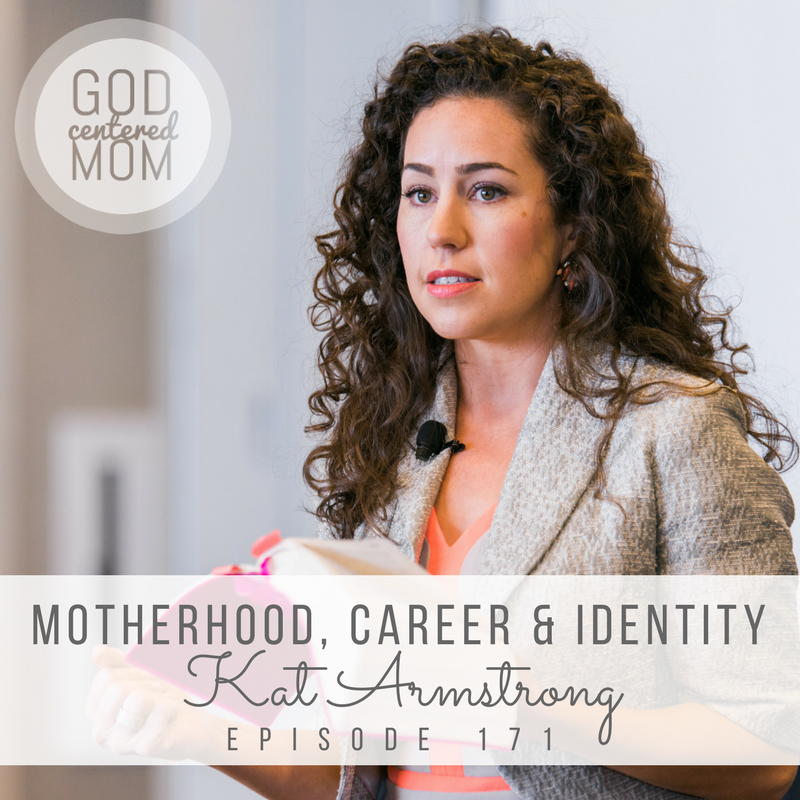 Whether you are a career mom, a stay-at-home mom or somewhere in the middle like me, I hope this episode encourages and equips you for your current season and those to come. Is there a biblical imperative to stay home with your kids? I could literally listen to this podcast episode every day. I’m a teacher mama who sometimes (ok, a lot) feels that mom guilt in my decision to go back to work, but this episode squashed SO MANY of those concerns! From changing the word calling to just how we view our motherhood and the motherhood of other moms and can be judgmental. This was probably my favorite episode yet because it just spoke directly to me. Thank you so much Heather! hey courtney! so thankful you were encouraged! And that you can be free from that guilt. mission accomplished! Thanks for listening!!! Can I just say THANK YOU! This past year I have been feeling guilty about working but my husband is a middle school teacher, he is doing what he loves and speaking into the lives of these kids but the pay is pretty awful so I work. I also stayed home for 9 months at one point and came to the place where I realized that staying home is not for me though I do adore my kids. I found that my guilt increased as I listened to more podcast because the bulk of them are run by stay-at-home moms who could not speak into the heart of the working mom. I also attend a church (that I love!) where the majority of moms are stay-at-home moms and even the older generation cannot speak out of a place of knowledge and understanding because they too stayed home. This episode came at such a beautiful time because I am due in two weeks with baby #4 who I will have 12 beautiful weeks with before once again diving back into work. My biggest struggle was with the idea of is it proper for a Christian woman to work out side of the home and both you and Kat nailed it for me particularly in addressing the agrarian society of the Bible vs. the modern society that we currently find ourselves in. The second struggle is the balance factor that you mentioned. If I attend Bible study or womens retreats and so on I am having to sacrifice precious time with my kids so that’s difficult. But again Thank you! I heard this podcast this morning and I just wanted to say thank-you so much for this refreshing content. So often as a Christian women (in Australia), I feel condemned and outcast as a working Mum. I have been a part of a bible study where women returning to work is seen as far from “God’s best”, and have really struggled as I have return to work after 10 years at home. I often feel that I need to defend my decision to return to study and work by telling everyone I am just doing it to send our 4 kids to a Christian school. But the real truth is that after 10 years at home I was feeling frustrated and felt a stirring towards some new assignments outside of the home. I still love my family, and do my best to make things work best for all of us. But I honestly feel that I am actually doing better at many aspects of parenting now that I’m working outside of the home. I feel more alive, and I’m less likely to meddle or get stressed unnecessarily about minor aspects of their lives. For now I am happy with my mixture of “assignments”, and I’m really appreciative of a podcast that affirms that God’s calling is not about staying home, it’s about loving and walking with God. Thanks again! We need to have more of these conversations in Christian circles so that women do not feel rejected and outcast when they return to work. Thank you. This is the first podcast of yours I have listened to and I am so glad I found your show! The day after I heard this, I applied for a part-time job after being a SAHM for 3 years and got the job. I feel as though a huge weight has been lifted. Thank you for helping me to reframe my view of calling, and to provide perspective and value in my current/past assignments. I’m just listening to this today, and I absolutely needed it! I’m a full time working mom, and I am wracked with Mom guilt every day, leaving my baby girl. Thank you, SO much! I have a question. Kat mentionned women in the NT leaving their husband in society to follow Jesus and support financially his ministry. Could you give biblical references for that ? Enjoyed your podcast. Just have a comment about your question of where we the church have failed. One area where I feel that we the church have failed is in supporting women is in failing to reach the women who are in a season of total physical, emotional, mental, spiritual exhaustion & depletion. There are seasons that some of us go through where we just need to be minister to & heal before we are well /stable enough to even begin ministering to others. We can’t give when all of our reserves are already spent. When our depleted needs are not met by the local church we withdrawl to find our healing where we are not constantly being told that we just need to do & give more. I have been in this season of trying to heal & restore my soul to have enough in reserve to share for the past 15+ years. God has continued to be faithful in my healing process. After dealing with infertility for 8 yrs followed by 15 yrs of mothering in the midst of being physically, mentally, emotionally depleted, I feel like I am finally beginning to be able to plug back into ministering to others. Its been very hard trying to make ends meet on just my husbands income. Sometimes I feel that financially I need to do more but in the deepest part of my heart after lots of prayer & soul searching & asking God to show me what I should do I really felt like He wanted me to stay at home until I was healed enough for myself to be physically restored & my home to be restored before taking on anymore. God has been SO faithful in providing as I have been obedient to this & when I don’t believe the lies of the enemy that tell me otherwise. Thanks for sharing this podcast & your helpful resources. Keep up your help in encouraging women for His Kingdom. Heather, Thank you so much for this specific podcast and tough discussion. It came at just the right time for me. I had been a listener of yours previously (on the way to work!) but took a break after choosing to stay home and moving to a new city. I had a restless first year staying home and seriously doubted my decision. It’s gotten easier but the financial constraints of being on one income are still pressing. I often go back and forth and recently applied for a full-time position on a whim. The fears that came after applying were startling and I’ve caught myself gazing at my children asking “how could I leave them?” while getting emotional. Needless to say, after returning to your podcast, this was the first one I downloaded and I’m so glad I did. It spoke to my heart and my motives. I appreciated hearing more about your background in language pathology and how you had the thriving career before having kids for a decade. I’m in the midst of the baby-making years only having recently given up the career so I think that’s in part why I’m so unsettled. But this podcast was such a blessing. Thank you again. I am a SAHM, who has always struggled with my desire to work. I tend to be a workaholic, so I have had a hard time reining myself in when I have tried to work from home. I really loved the idea of assignments vs calling. Calling is most definitely that we are called to be as Christians, not what we do. I have started and failed multiple things from home, in part because I have guilt over time spent working and not with my kids (whom we also homeschool, so they see me tons). I’ve recently started another venture, a blog, that I want to use to help women create margin in their lives so they can have the opportunity to figure out what they are assigned to do in life and encourage them to do it. I have been a long time listener, although this is my first time commenting. I have to say that this podcast has been an encouragement to me when I needed it and has made me dream of my blog also becoming a space for women to reach out to speak into other women’s lives and maybe even one day become a place for mentorship to happen. Thank you for the space to be imperfect and the encouragement to always keep growing.